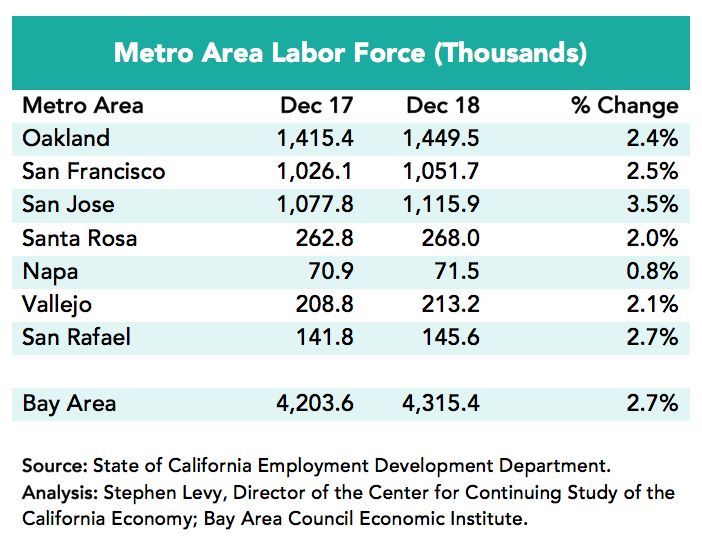 Bay Area job growth surged in December supported by strong labor force growth and continuing low unemployment rates. The surge in labor force growth was the result of higher participation rates from existing residents. Population growth in the region is falling as birth rates fall and out migration increases. But very low unemployment rates and record levels of labor force participation rates raise questions as to where the workers will be found to fill planned future job growth. Year over year job growth rose to 2.4% and the region outpaced the 1.8% growth for the nation and 1.7% for California. 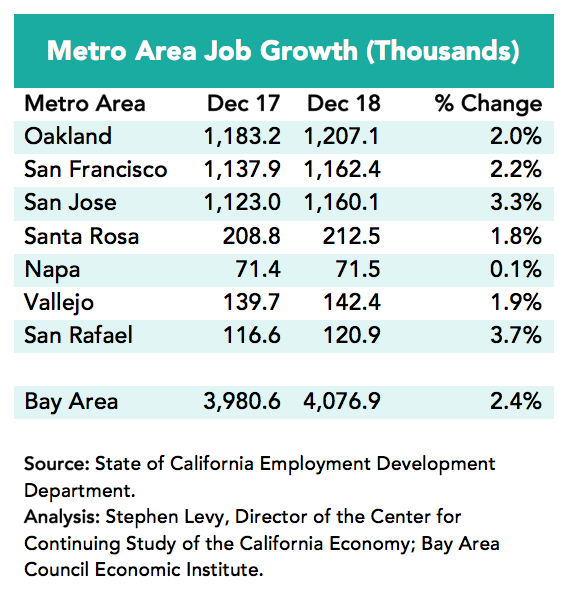 The San Jose and Santa Rosa metro areas led the region in job growth over the past 12 months. 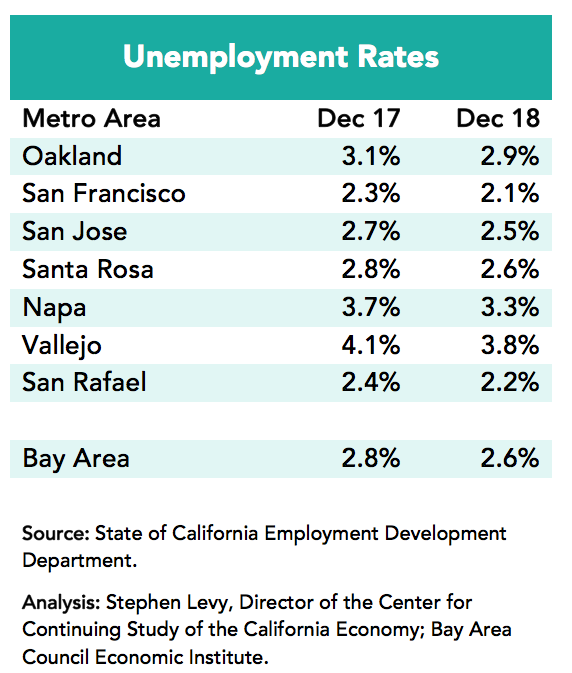 Unemployment rates remained low in December 2018 throughout the region with a 2.6% regional rate the same as in October and November. Labor force growth surged by more than nearly 110,000 (+2.7%) for the past 12 months driven by record levels of participation by all age groups over 25. 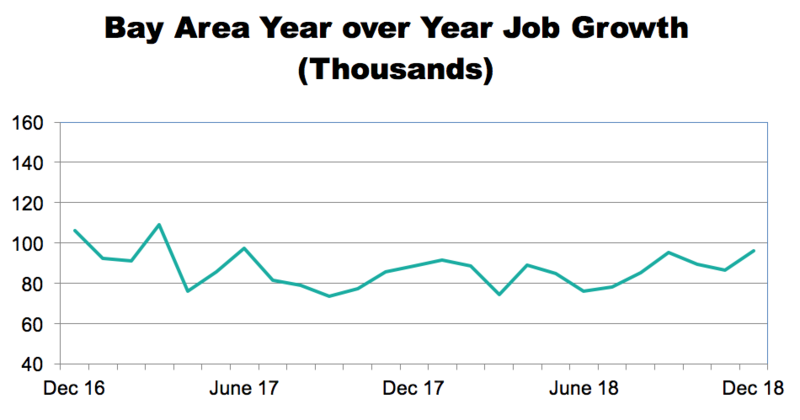 Year over year job growth rose in December to 96,300 and has remained in a narrow range since early in 2017. This occurred despite slowing population growth and rising outmigration in the face of high housing costs. 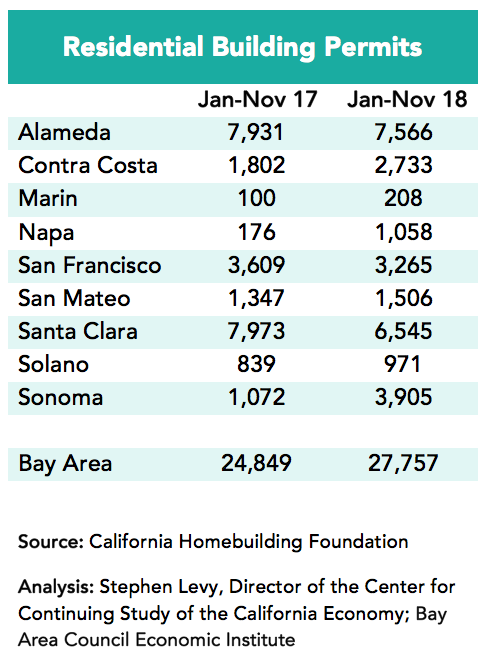 Bay Area population growth has slowed as a result of lower levels of natural increase and rising levels of domestic out migration. Total growth fell from above 100,000 in 2013 to 37,000 in 2018. Domestic migration moved from plus 29,000 to minus 42,000 in 2018 as a growing number of residents moved out as a result of rising housing costs. Foreign migration increased in 2018 and was higher than the region’s total population growth. 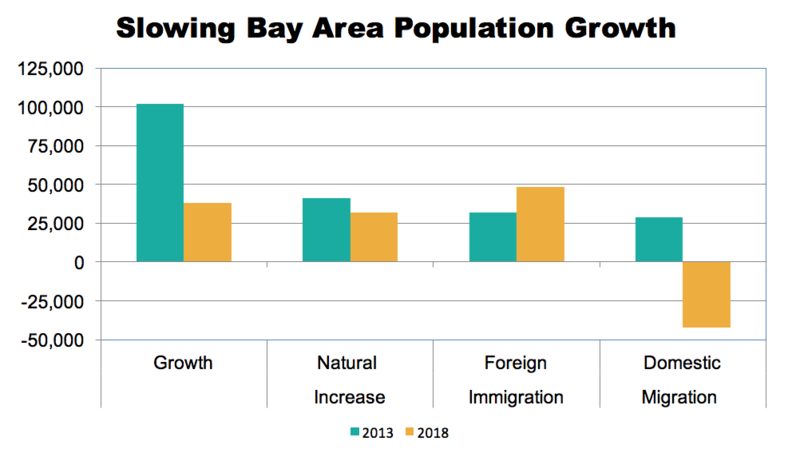 A separate memo has been prepared on population trends in the Bay Area. Recent job growth was made possible primarily from reentry into the workforce of existing residents as the tight labor market encouraged employers to consider applicants they previously looked past. Bay Area labor force participation rates are at record levels as residents who dropped out of the workforce now find eager employers. The slowdown in new permits has been accompanied by a number of projects coming on line and a softening of resale home prices. 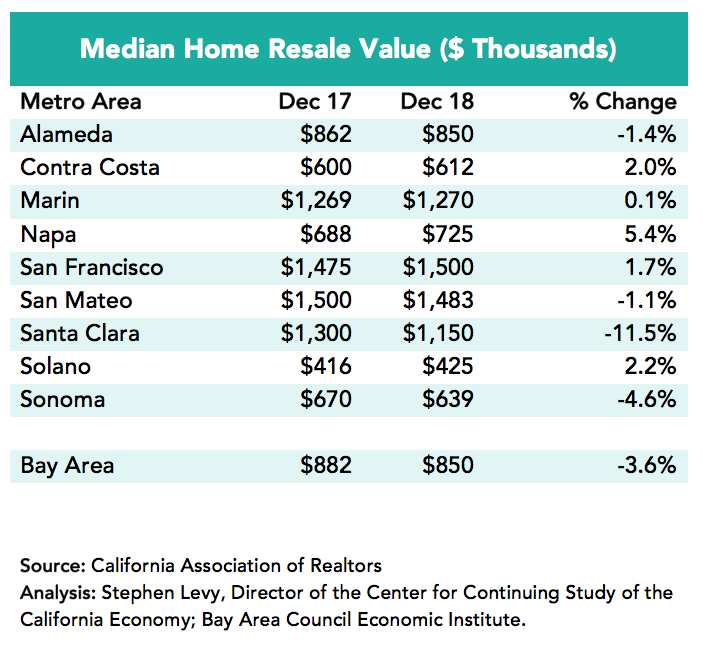 Median prices are actually down year over year as high prices, new units and out migration have cooled the market at least temporarily. While labor force participation rates could rise further, at the same time the aging of baby boomers will move many into the 55+ age groups, which have much lower rates compared to residents aged 25-54. So the region will continue to struggle to find new workers as increasingly they will come from people moving to the region, which has become difficult given the housing shortage and high housing costs. The struggle to attract and house new workers will happen as 1 million Bay Area residents retire by 2030. The next needed steps involve lowering the cost of building new housing, changing zoning to allow more and less expensive housing to be built and, hopefully, state funding to offset some costs of housing. Perhaps the hardest challenge to overcome is the lack of affordable housing for middle income residents who are not eligible for subsidized housing even if it were available in sufficient quantity. For readers who want to view the final adopted compact of the Committee to House the Bay Area (CASA), look at the recent meeting packets for December at https://mtc.ca.gov/our-work/plans-projects/casa-committee-house-bay-area/casa-meeting-schedule.